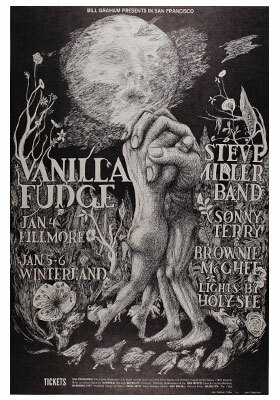 As mentioned in our previous posts, we at The Psychedelic Art Exchange come to our appreciation of concert poster art not only as collectors, but as true fans of the live music experience. This time of year provides music lovers like us with several opportunities to take part in the wide array of music festivals across the nation. Today's Festival goers have many exciting options from which to choose. Examples of these well organized and music packed events include the widely eclectic and sprawling Bonnaroo festival, Northern California's High Sierra Festival, The Gathering of The Vibes in the Northeast, and this coming weekends' offering "The All Good Festival," which takes place at Marvin's Mountaintop, Masontown West Virginia. In many ways, the seeds that were sown in the 1960's ballroom scene have blossomed into today's "Jam Band " festival scene. The spirit of the music and community that emerged from San Francisco in the sixties is still present at these festivals. Performers and attendees alike are cut from the same cloth that was woven in "the day". The ideals of artistic individuality & creative freedom paired with playful exuberance are ever present at these joyful gatherings. PAE will be at the All Good this weekend and invite any of our fellow posters collectors to join us for a beverage at the festival. Please feel free to contact us for times and locations.